Ginger is a Texas native now living in Ohio. She's taken her life-long passion for music and combined it with a love of history and tradition, and melded it all into a delightful style of Celtic Folk! 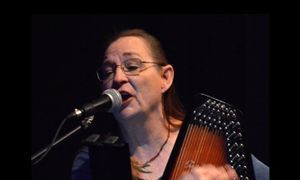 Performing both traditional and contemporary songs, she plays her autoharp and whistles. In her own words, she is "Celtic With A Twist!" because her music covers such a spectrum from original to traditional, mystical to educational. Be prepared to laugh, cry and clap along during one of her performances! Ginger and her 'harps have traveled to the blue Caribbean, the glaciers of Alaska and her heart's home, Ireland. She performed both with her band “Rowan Moon” and as a solo act at renaissance and medieval faires and music festivals in Texas, Louisiana and Oklahoma. At one point, her faire friends gifted her with a special name, “Lark of the Clans” in recognition of her music and service. Later, her path took her to Wyoming and Colorado before landing in Ohio in 2009. Her songwriting has been recognized many times. She has been nominated for the Best Female Vocalist Award by the Internation Pagan Music Association of 2016. Her signature song, “It Is Time” won a song competition sponsored by the Celtic Nations group led by Danny O'Flaherty in 2005. She also wrote the title track to O'Flaherty's 2007 album “Secret Garden” along with two other songs. That album placed third in the Just Plain Folks national competition. Ginger was also honored with the 2015 Stark County "Women of Worth" for her ongoing legacy of service to the community because she so often plays for causes and benefits and for members of the senior community. Since her move northwards, Ginger has found a growing audience at local wineries, coffee shops and listening venues like Euclid City Limits. Ginger has been a featured performer at some notable concert series like Mountain Rose , Rootstock, Canton First Friday and Medina Parks. She has become a regular on the music festival circuit, playing shows from Ohio to Indiana, Wisconsin, Georgia, Tennessee and Florida. 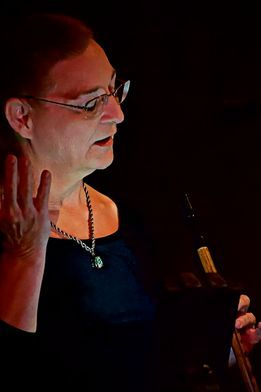 She has shared the stage with many notable musicians like Brian Henke, Tuatha Dea, Wendy Rule, SJ Tucker, Ginger Doss, The Night Travelers, Beltana Spellsinger , Murphy's Midnight Rounders and The Troubadours of Divine Bliss. Her penny whistles were a surprise addition to the Woodchoppers' Ball at the historic Kent Stage in 2016. She has sung harmony and played whistle with some of the greats of Celtic music, too. She often joins Brian Henke, Westside Steve Simmons and the New Barleycorn with her penny whistles. She has jammed with Aoife Clancy, Danny O'Flaherty, the Makem and Spain Brothers, Jimmy Crowley, Jeb Marum, the Brobdinagian Bards and the Bedlam Bards. 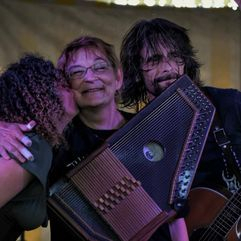 Twice she has competed in the International Autoharp Championships at the Walnut Valley Festival in Winfield, Kansas. Ginger's music is now featured on Pandora Radio, iTunes, Spotify, Rhapsody and several internet radio stations.